The second largest city in the state of Rajasthan, India, Jodhpur is a popular and hot tourist destination in India as well as foreign. Each part of Jodhpur is a delight to watch because of its picturesque desert landscape. Jodhpur was formerly known as Marwar. Jodhpur features many beautiful palaces, forts and temples, apart from a stark, scenic desert landscape. The city is known as the "Sun City". It is also known as the “Blue City” due to the indigo tinge of the whitewashed houses around the Mehrangarh Fort. The old city of Jodhpur is surrounded by a th ick stone wall. The wall has six huge gates called Nagauri gate, Merati gate, Sojati gate, Jalori gate, Siwanchi gate and Chand pol. The lifestyle in Jodhpur is unusually fascinating with folks wearing lovely multi-colour costumes, artistically designed. Women folk wear wide gathered skirts and a hip length jacket, with three quarter length sleeves, covering the front and back. The colorful turbans worn by the men folk add more color to the city. Mehrangarh Fort : Located atop a 125 m high hill, the Mehrangarh Fort lies at the outskirts of Jodhpur city. The magnificent Mehrangarh Fort (Jodhpur ka kila) is one of the most majestic and colossal forts in India. 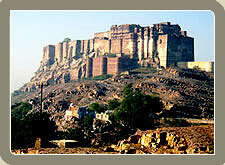 The fort was originally started (c.1459) by Rao Jodha, founder of Jodhpur. However, most of the extant fort dates from the period of Jaswant Singh (1638-78). The walls of the fort are up to 36 m high and 21 m wide; they enclose some lovely structures. The beauty and the grandeur of numerous palaces in the fort narrate a saga of hard sandstones yielding to the chisels of skilled Jodhpuri sculptures. Noteworthy of these palaces are the Moti Mahal, the Phool Mahal, the Sheesh Mahal, the Sileh Khana and the Daulat Khana. There is a museum inside this fort which contains wonderful collection of palanquins, howdahs, royal cradles, miniatures, musical instruments, costumes and furniture. Umaid Bhavan Palace : This massive palace is one of India's most recent palaces. The romantic looking Umaid Bhavan Palace was actually built as a public relief and employment project during a long period of drought. A special type of sandstone, called Chittar sandstone, has been used in the construction of this palace and this gives it a special effect. For this reason, it is also referred to as Chittar Palace by the locals. The palace was designed by H.V. Lanchester The palace was completed in 16 years. Part of this magnificent sand stone and marble palace containing over 300 rooms have been converted into a museum, deluxe hotel and a royal residence. Sardar Market : These colourful markets are located in the heart of Jodhpur. It has a wide range of Rajasthani handicrafts. Narrow lanes lead to little shops selling antiques, silverware and a wide range of handicrafts and regional textiles. Jaswant Thada :A collection of royal crematorium including that of Maharaja Jaswant Singh II, in white marble, is situated in the close proximity to Mehrangarh fort. Built in 1899, the cenotaph also houses the portraits of the rulers of Jodhpur. There is some beautiful marble lattice work. Mandore Garden : Located at the distance of 8 km north of Jodhpur, Mandore is the ancient capital of Marwar. The main attraction of Mandore is Mandore Garden. The extensive garden is beautifully laid with high rock terraces. Garden is open to visitors daily from sunrise to sunset. There is a famous 'Hall of Heroes' here that contains 16 colossal figures carved out of a single rock wall. This garden also had a small museum. 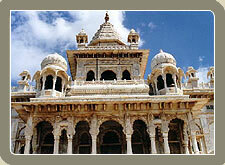 It houses the royal cenotaphs of Maharaja Ajit Singh. Shoppers Stop Here : Jodhpur city has a vast wealth of historic attractions and colourful markets which specialises in handicrafts & antiques. Jodhpur is favorite place for exclusive shopping. Handicrafts & Antiques : Jodhpur is the major exporter of wooden & iron furniture, antiques and traditional style Jodhpuri handicrafts. The emporiums in Jodhpur are organized for exporting large quantities of handicrafts and antique reproductions. One can find here textiles, silver, jewelry, instruments, pottery, boxes, carved ducks, metalwork, marble figures, paintings, copper, brass, antique reproductions, ivory, insignias in white German metal, bed covers, wall hangings, puppets, clothes, old doors, and lots of furniture. Rajasthan is well known for colourful fair and festivals. Being an important city in Rajasthan, Jodhpur too celebrates many festivals with great zeal and enthusiasm. Some of the important festivals of the region are Marawar Festival, Gangaur Festival, Teej Festival, Nag Panchami Festivals. 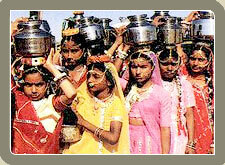 In all these you can see the colorful culture of Rajasthan. By Air : Jodhpur is connected with regular flights by Indian Airlines / Alliance Air and Jet Airways. The airport is 5 km from downtown. Taxis are available for quick transfers. By Rail : Jodhpur Railway Station is located at the distance of 2 km from the city. By Rail it is very convenient. Jodhpur is on the Western Railway's broad-gauge network and is linked to various centers in the region by express and passenger trains. An excellent connection to Jaipur is Inter City Express (4.5 hours). The Railway Station is in the heart of town. By Road : Jodhpur is properly connected by luxury and deluxe coaches, overnight connections. Several coach operators run buses between Jodhpur and other major centers in the regions. Reservations for the State Roadways buses can be done at the Tourist Reception Centre.